Plants that make up the Solidago genus are hardy perennials that range in height from 60 cm to 2.4 m.
They bloom in summer through to early august and carry spikes of minute yellow flowers. One of the most common names for Solidago is Golden Rod. Solidago rugosa - Fireworks Goldenrod by F. D. Richards. Height: 4 to 96 inches (10—240 cm). Native: Americas, Europe, and Asia. Flowers: Late summer through to early autumn. Flower Details: Yellow/Gold. Spike-like inflorescence or racemes containing up to 1500 tiny florets. Foliage: Herbaceous. There is a large variation in the leaf shape and characteristics in Solidago plants. Typically woody, with erect stems and narrow leaves. Sow Outside: Cover seed. Before the last frost or in autumn. Sow Inside: Germination time: two weeks to two months. Temperature: 50°F (10°C). Seven or eight weeks in advance. Transplant outdoors before the last expected (light) frost or in autumn. Space at 10 to 36 inches (25—90 cm) depending on species size. Requirements and care: Full sunlight or partial shade. Good drainage. Acidic to neutral soil pH 5 to 7. Average soils for best blooms, rich soil leads to enhanced vegetative growth. Deadhead to prevent seed-set. Cut back to the ground in autumn. Provide support in windy locations for taller varieties. Divide every three or four years to maintain vigor. Propagate: by dividing in the spring, self-seeds freely. Miscellaneous: Although Goldenrod is associated with hay fever (largely due to being in-bloom at peak pollen times), its pollen is actually too heavy to be carried by the wind, with pollination being performed by bees. That said, handling a raceme with 1500 flowers on it is very likely to lead to sneezing in people with allergies. When growing Solidago plant species such as Golden Rod outdoors from seed then either sow before the last frost of spring or towards the end of autumn. Once sown, lightly cover the golden rod seeds. They can be grown in either sunny or partially shaded parts of the garden that have good drainage. Ideally the soil that plants grows in will be acidic to neutral (pH 5 to 7) and moist. 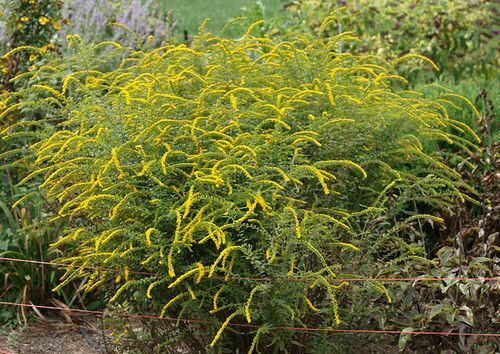 If starting off golden rod plants indoors then do so about seven weeks in advance. The seeds will take about two to eight weeks to germinate at a temperature of 10 degrees centigrade. The plants should be put outdoors in either late autumn or just before the last frost of spring. Solidago plants should be spaced at 30 cm (small Solidago varieties) or 60 cm to 1 m (larger species). It is fairly easy to care for Solidago. They are tall plants so provide a stake; water frequently to keep soil moist; deadhead flowers before they have a chance to set seed; cut back to the ground in autumn; divide the plants every three years or so to maintain vigorous growth. 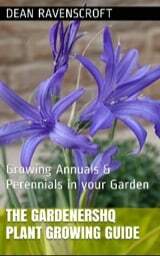 If you require more plants and do not want to grow from seed then they can be propagated by division in the spring.